YoYoFactory Restock! Flight, Horizon, Too HOT! New SPLASH Edition HORIZON from YoYoFactory! 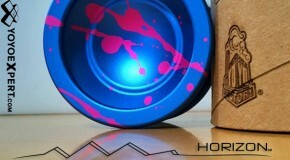 Check out the all new YoYoFactory Horizon is an Awesome New Colorway! Blue W/ Pink SPLASH! HORIZON AVAILABLE HERE! SPECIAL RELEASE! YoYoFactory HORIZON – Triple Crown Edition!